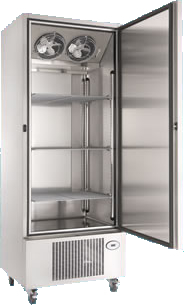 Double fan system ensures the cabinet recovers temperature very quickly, even in busy kitchens where the fridge door is in constant use. Bottom mounted refrigeration system: efficient in high ambient conditions as it draws air from the coolest part of the kitchen. Ducted airflow system ensures even temperature throughout.